We saw in an earlier post – Mexico’s shoe (footwear) manufacturing industry: regional clustering – that Mexico’s shoe manufacturing is concentrated in three major areas: León (Guanajuato), Guadalajara (Jalisco) and in/around Mexico City. Shoes are also an important international trade item. Latin America’s largest international footwear trade show is SAPICA (Salón de la Piel y el Calzado), which is held in León twice a year. Each time, it attracts 12,000 buyers from the USA, Canada, Europe, Japan, and Central and South America. Value of exports: $250 million (dollars). Exports have risen steadily since 2006, despite the global economic difficulties. Export destinations, by volume: USA 82%, Brazil 5%, Guatemala 2%, Japan 2% and Canada 2%. Export destinations, by value: USA 84%, Japan 4%, Canada 2%, France 1% and Brazil 1%. Sources of imports, by volume: Vietnam 39%, Indonesia 21%, China 11%, Brazil 7%, Malaysia 5% and Thailand 5%. Sources of imports, by value: Vietnam 43%, Indonesia 16%, China 14%, Italy 7% and Spain 6%. At first sight, these figures do not suggest that Mexican manufacturers have much to worry about from Chinese shoe manufacturers. However, it is believed that many of the shoes entering Mexico from Vietnam and Indonesia actually originate in China. 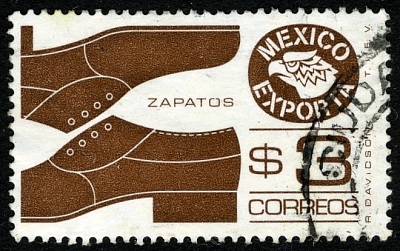 In addition, some Chinese shoes are thought to be repackaged in the USA for eventual export to Mexico. Shoe manufacturers’ representatives in Mexico opposed China’s entry into the World Trade Organization (WTO) since they feared it would unleash a flood of cheap Chinese imports into the country. In an effort to help protect national manufacturers, the Mexican government has, for most of the past 20 years, levied a compensatory 35% tariff on shoes originating in China. Mexico’s shoe industry faces periodic shortages of some raw materials. In addition, the sector’s supply chains and delivery systems need strengthening. The improvement of product quality may require further investment in technology and research. As tariff barriers are lifted, Mexico’s shoe manufacturers will face greatly increased competition from overseas. Source of statistics: CICEG (Guanajuato Shoe Manufacturers Association) Situación de la industria del calzado en México. Mexico’s shoe (footwear) manufacturing industry: regional clustering How did Mexico rank on the 2010 Legatum Prosperity Index?